Friday marks the 100th anniversary of the Triangle Waist Co. fire, a blaze at a sweatshop in New York that shocked the nation and became a defining moment in the history of the American work force. Its death toll would reach 146 — mostly young Italian and Jewish immigrants struggling to earn a living making blouses in a garment factory in Manhattan’s Greenwich Village. Shock and outrage from all strata of society quickly brought demands for better working conditions. New York state enacted nearly 40 labor laws in the following three years. Congress passed the National Labor Relations Act in 1935, improving workers’ rights across the country. Remembering The Triangle Shirtwaist Factory Fire is a slideshow from TIME Magazine. Remembering the Triangle Fire 100 years later comes from CNN. 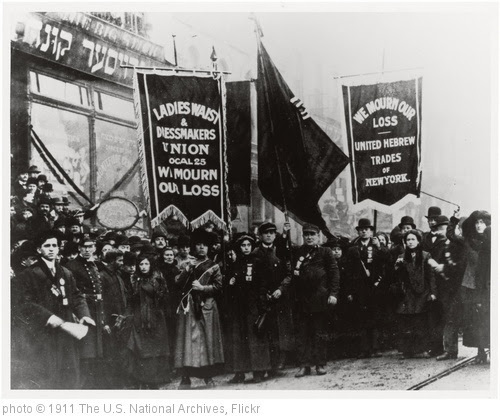 100 Years Later: Examining the Impact of the Triangle Shirtwaist Factory Fire is the title of a great resource from The New York Times Learning Network. 1911 Fire Proved Photojournalism’s Power is from The New York Times photo blog. This is the central page for all the NY Times related resources. The 1911 Triangle Fire Tragedy is a slideshow from CBS News. Triangle Fire is an excellent resource from PBS. A Century After Triangle Fire, Labor Struggles Remain is from Voice Of America. Teaching About the Triangle Shirtwaist Factory Fire is from the Zinn Education Project. Photo Essay: The Triangle Shirtwaist Factory Fire is from PBS. You can read a transcript to the video here. The NEA has many related resources. Here’s an interactive on the fire.